The chorus is indeed instrumental in the success of an opera performance. Its members are possessed of a high degree of artistry and professionalism. Evening after evening they demonstrate their command of the styles, genres and languages of opera. This breadth of proficiency has been on proud display in recent years as the chorus of the Deutsche Oper Berlin has gone from strength to strength. Building on its international reputation as one of the supreme interpreters of the operas of Wagner and Verdi, the chorus of the Deutsche Oper Berlin has reaffirmed its ability to excel in the musical theatre of the 20th and 21st centuries with its productions of Britten’s PETER GRIMES and BILLY BUDD, Shostakovich’s LADY MACBETH OF THE MTSENSK DISTRICT and Helmut Lachenmann’s THE LITTLE MATCH GIRL. Opera Chorus of the Year 2008, 2009 and 2010 and recipient of European Chorus Award presented by Pro Europa Foundation. Years of intensive rehearsals in the works of the repertoire are required before a new member of the ensemble can be said to have acquired a level of mastery. Singers are gauged not only by the quality of their voice but also by their acting skill and ability to work as part of group. Chorus members also have to be receptive to new ideas and techniques proposed by the director or conductor. Preparatory work in the chorus hall, which is where new parts are studied and developed, also requires great attentiveness on the part of chorus members. The aim is to give the chorus its own, unmistakeable sound while incorporating it seamlessly into the work as a whole. No easy task when one considers that an opera chorus, like an orchestra, comprises a panoply of artistic individuals, whose full effect is only realised as a single corpus onstage. 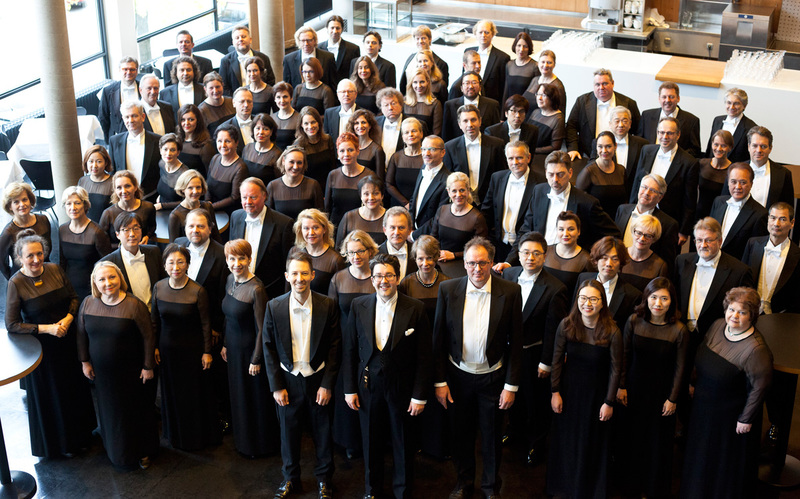 A number of renowned chorus masters and conductors have left a lasting imprint on the Deutsche Oper Berlin Chorus, one of the world’s great companies in the field of musical theatre. Prominent alongside Walter Hagen-Groll, who built and fashioned the chorus over a period of almost 50 years, are the names of Marcus Creed and Karl Kamper. From 2007 to 2016 William Spaulding, as Principal Chorus Master, imbued the chorus with its own distinctive sound, resulting in no less than three “Opera Chorus of the Year” awards and a runaway popular and critical triumph with a guest performance of TANNHÄUSER at the London Proms. There followed an interim period with Raymond Hughes at the helm. Since the start of the 2017/18 season the position of Chorus Master has been held by Jeremy Bines, former head of the Glyndebourne Festival Chorus. As an adjunct to the work of the chorus live onstage the Deutsche Oper Berlin also produces CDs and DVDs of its performances. Christian Thielemann’s production of CARMINA BURANA by Carl Orff – to cite but one example – was released by Deutsche Grammophon. The concert association of the chorus of the Deutsche Oper Berlin, founded in 2013 and composed of members of the chorus, does sterling work as a cultural ambassador for Berlin. One of its first high-level assignments came on 4th August with an appearance at the legendary BBC Proms at the Royal Albert Hall in London. Click here for the website of the Konzertvereinigung des Chores der Deutschen Oper Berlin e. V.
At the start of the 2017/2018 season the Briton Jeremy Bines, currently Chorus Master at Glyndebourne Festival Opera, takes over in the same capacity at the Deutsche Oper Berlin. Bines has been at the helm of the acclaimed Glyndebourne Chorus since 2009. In the words of one of many plaudits (The Telegraph, 29th July 2015): “The chorus is the soul of everything that Glyndebourne is and stands for: every year, one can only marvel at the fresh beauty of the sound it produces as well as its resourceful and imaginative acting… Glyndebourne’s chorus is special”. For this year’s festival he has been preparing the choruses for THE MASTERSINGERS OF NUREMBERG, THE BARBER OF SEVILLE, THE CUNNING LITTLE VIXEN, THE MARRIAGE OF FIGARO and BEATRICE ET BENEDICT. From 2006 to 2007 Jeremy Bines was co-répétiteur at the Royal Danish Opera in Copenhagen before being appointed its chorus master. He is multilingual and can conduct rehearsals in five languages. We are delighted that Jeremy Bines has agreed to join the staff of the Deutsche Oper Berlin. With approximately 150 singers, the Children’s and Youth Chorus of the Deutsche Oper Berlin forms a well-integrated part of the opera house ensemble. Children and teenagers receive solid musical and vocal training in choral groups, working alongside youngsters of the same age. The aim is for them to appear onstage alongside opera professionals and show what they are capable of in concert performances. In the 2018/19 season the children’s chorus will once again feature in a raft of productions including WOZZECK, TOSCA, THE NUTCRACKER, THE CUNNING LITTLE VIXEN, CARMEN, BORIS GODUNOV, PARSIFAL and OTELLO. Aside from the opera performances at the Deutsche Oper Berlin, all the choral groups also appear at other venues in Berlin and further afield. Our youngest budding singers in the Mini Chorus focus for example on rehearsing carols in the run-up to Christmas. The Children’s Chorus, the Concert Chorus, the Voice-Changers (our company of young male singers) and the Youth Chorus cover a repertoire stretching from the Renaissance to contemporary music. In July 2018 the Concert Chorus will travel to Tshwane, South Africa, for the World Choir Games. A special concert is scheduled for 26th March 2019. This season the Children’s Chorus celebrates its tenth anniversary and the Youth Chorus its fifth! We’ll be making a noise to mark the occasion. The Children’s and Youth Chorus of the Deutsche Oper Berlin is sponsored by Berliner Volksbank and Dobolino e.V.